The crest with central urn flanked by ribbons and leaf carving, the guilloche carved frame with trailing bellflowers, all terminating on floral and reeded feet. George III giltwood mirror with urn form crest above an open scroll and carved leaf frame. Mirror plate set within a scroll carved inner and outer frame decorated with C-scrolls, rocaille and cabochons. Original glass. Provenance: Park Avenue, New York apartment. Arched carved crest with floral and leaf carving with central faded watercolor panel over a mirror plate set in a carved frame. 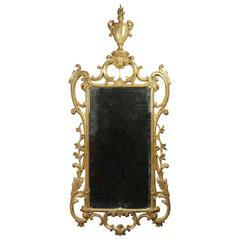 Early 20th century Italian carved giltwood mirror. Highly carved with display shelves surrounding it. Four smaller shelves and one larger at the bottom. 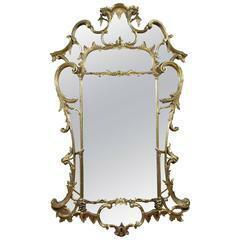 Louis XVI style giltwood mirror, circa 1930-1950. This mirror has excellent gold leaf gilding and beveled glass. The pediment is gesso and gold leaf. 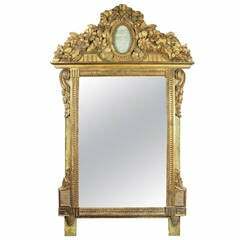 Modern carved giltwood mirror designed by Christopher Guy Harrison of Harrison & Gil. Excellent quality with robust carving. Beveled mirror.